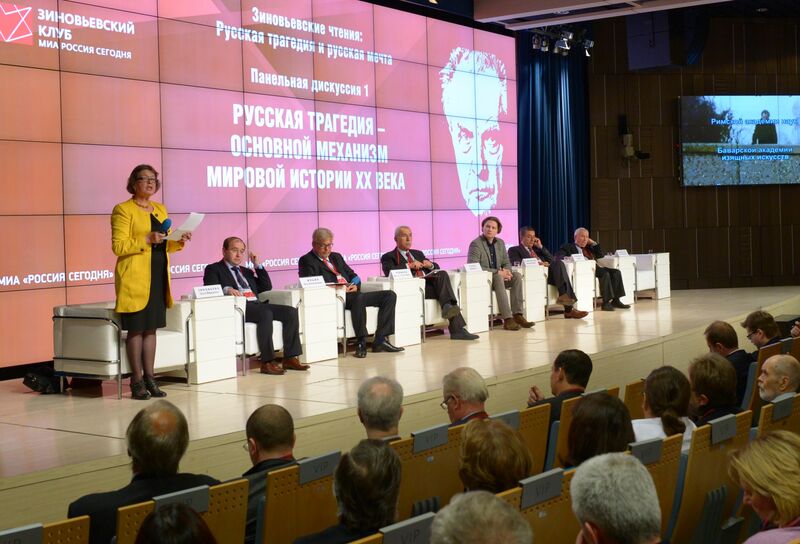 Dmitry Kulikov comments on the results of the VI International Zinoviev Readings, Alexander Zinoviev and Modern Ideologies, held at Rossiya Segodnya. Today, October 29, is the 93rd birth anniversary of the great Russian and Soviet thinker Alexander Zinoviev. Zinoviev's creative heritage is immense in its cultural significance. His works provide a stern and quite clear-cut picture of modern humanity. In this sense, he is the first after Marx to offer a real sociology (a description of the socio-political and socio-economic system) of the modern world. In their ability to capture the essence of the historical process and its real contemporary problems, his works surpass by far anything written by current Western scholars. Based on Zinoviev's thinking methods, we can obtain a real picture of "what is." But, to move forward, we also need to have a picture of "what should be." True philosophy has a duty to answer this question. Founded by Zinoviev and his colleagues at the Philosophical Department of the Moscow State University (MGU) in 1952, the Russian philosophical school of thought has all the necessary tools for formulating a new Russian post-Marxian philosophy. But this philosophy would have been impossible without Zinoviev's intellectual contribution. This is a speculative heritage which we can count and lean on in the face of 21st-century challenges. On Tuesday, October 27, Rossiya Segodnya hosted the 6th International Zinoviev Readings, "Alexander Zinoviev and Modern Ideologies." The readings were a highly representative event due to both the high social status of many participants and the depth and rich content of discussions. The debates focused on: "The Modern World and the Struggle of Ideologies," "The Ideology of Globalization and Possible Alternatives," and "Zinoviev: An Ideology of the Future." That a discussion of "ideology" as both a philosophical concept and socio-cultural institution was organized is far from accidental. During so-called Perestroika (during the late 1980s — the 1990s), ideology was interpreted as an almost criminal factor propping up totalitarian regimes. Simultaneously, it was claimed that the "free democracies" had no ideology at all and that that was, supposedly, the most important sign of their freedom. Practically all participants in the discussions were unanimous in that the negation of and disdain for ideology was what Zinoviev called a big swindle, one which helped to exercise concealed, non-public and, as philosophers say, non-reflected ideological manipulation. Ideology is always with us. Without it, a human being would be unable to exist as a social phenomenon. Neither would he be able to perform a single social act. Ideology is often invisible like the air, but it is always present. And modern man would do well to know this. After all, knowing that you always have an ideology will make it possible to ask the following important questions: What is my ideology all about? What is the origin of my ideology? Is my ideology some sort of knowledge or a set of beliefs and what is the difference between the two? There are a lot of other questions of a similar nature that, when posed, are the only thing that enables a man to live and act sensibly. This is the first point that was discussed at the readings. Second, the participants debated what kind of ideology was needed for us (at first, in terms of formal requirements rather than content). It proved possible to distinguish between (dogmatic) ideologies based on various types of social beliefs and those based on social scientific knowledge, or still others that could be proved or disproved by cultural and historical experience. Let me say a few words about science and scientific thinking. The scientific method is based on a hypothesis, that is a fundamental supposition or assumption and an experiment, which either must refute or prove the hypothesis. It must be understood that there is no such thing as an unsuccessful scientific experiment, because a hypothesis proved both right or wrong adds new learnings to the available knowledge base. New knowledge (conventionally positive or conventionally negative) promotes progress and there is no other way for mankind today to gain real know-how. This is how the scientific method works in natural sciences. Karl Marx transferred the scientific method from the natural to social sphere and the world of human thinking and acting. He put forward his hypothesis on Communism, while we in Russia staged a grandiose social experiment related to that hypothesis. As estimated by Alexander Zinoviev, we have built "real communism" and it is quite illogical to assess its successfulness or lack thereof from the scientific point of view. The experiment took place and our true task is to distill knowledge from this experiment. If we are successful, we'll have a real resource for a new social project and a next step in our development — priority development. If we fail, there will be no development and we'll have to withdraw from History. In the 20th century, we involved half the world into this experiment and forced the other half to seek self-determination and develop with regard to and in rivalry with our experiment that was, without exaggeration, of planetary importance. The fact that almost all participants focused on the Soviet project and the standoff between it and the American project has nothing to do with nostalgia. Rather, it is an attempt to make a breakthrough to the knowledge that can be derived from the experiment, provided we want to speculate about our human world in a scientific way. Alexander Zinoviev claimed that human nature entirely or almost entirely lost its naturalness and became artificial in the 20th century. He said that mankind entered the epoch of "planned history." But you can only plan and design on the basis of knowledge. Dogmatic beliefs used as the basis of such projects (be it communism or liberal democracy) are historically untenable, something that has been proved in the course of the Russian experiment. The thesis on "planned history" is of fundamental importance as an indicator of what becomes of macro-social organizations, like political nations and states, that have refused to become involved in experiments with themselves and, hence, will be unable to exist in Grand Human History. They will simply be non-competitive in a world of "planned history." Social designing and social engineering — which means a big social experiment — is the most up-to-date and to our knowledge the only existing way of existence in this epoch of planned history..
Based on Alexander Zinoviev's creative legacy, we can and must make yet another assertion, that the nations, states and civilizations that become the first to design a pattern of scientific social knowledge (a truly humanitarian science) by experimenting on themselves will be the recipients of as powerful a resource for priority development as West European civilization had 400 or 500 years ago in the form of natural sciences and engineering. Many interesting foreign guests attended the readings, but the most important comments, as I see it, came from Mr. Ajay Goyal, India: We in India realize very well that the Russians are a nation of fighters — not in the sense that they fight all the time but meaning that a true fighter is someone who is ready to sacrifice his life for his ideals. I think that this is of fundamental importance for understanding the real meaning of ideology in human life and particularly for Russians.